I thought I knew what delicious marinara tasted like. But then I made this recipe, and from 8 simple ingredients and most importantly a bit of time, I had the most magical, mouth-watering sauce. It’s a classic marinara, like the kind you’d find at a good Italian restaurant. With a concentrated tomato flavor and almost buttery mouthfeel. Savory with just the right amount of natural sweetness, undertones of herbs, caramel-y hints of garlic and onion. I’ve made a lot of tomato sauces over the years, have many recipes on my site, and I’ve enjoyed them all, but nothing comes close to this long simmered marinara. 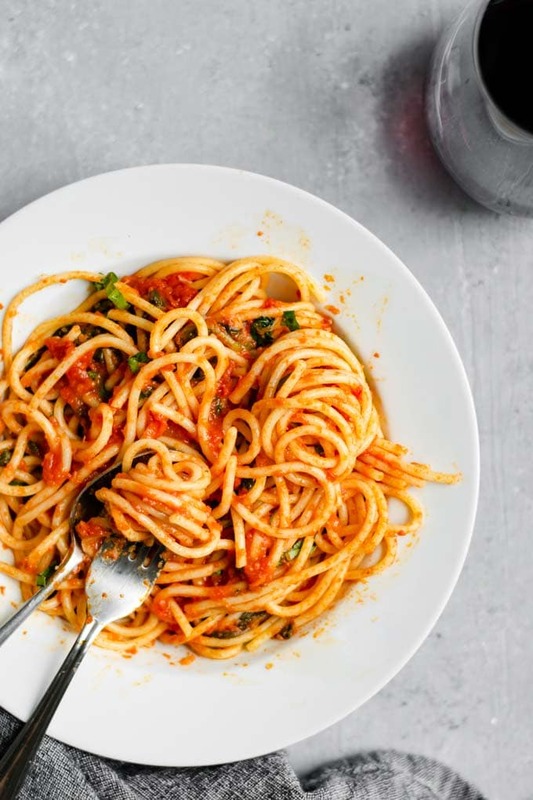 It’s the kind of recipe that makes you want spaghetti for dinner every night of the week. And if I’m being honest, there’s nothing about this recipe that requires the spinach. In fact, it’s barely detectable, and that’s kind of the point. If I’m not careful, I can get into a rut of not preparing a veggie side to go with my main dish, and so finding easy ways to add vegetables on lazy days is extra important! I don’t know about you but sometimes the thought of cutting up and prepping a vegetable is daunting, though I’m fine with taking an hour to simmer a sauce. But ya know, that’s hands off. Keep a box of baby spinach in your fridge and it’s an easy matter to grab a handful (or like, pound) of greens to add to your meal. It’s an instant boost of fiber and nutrients, and it melts away into that gorgeous red marinara. 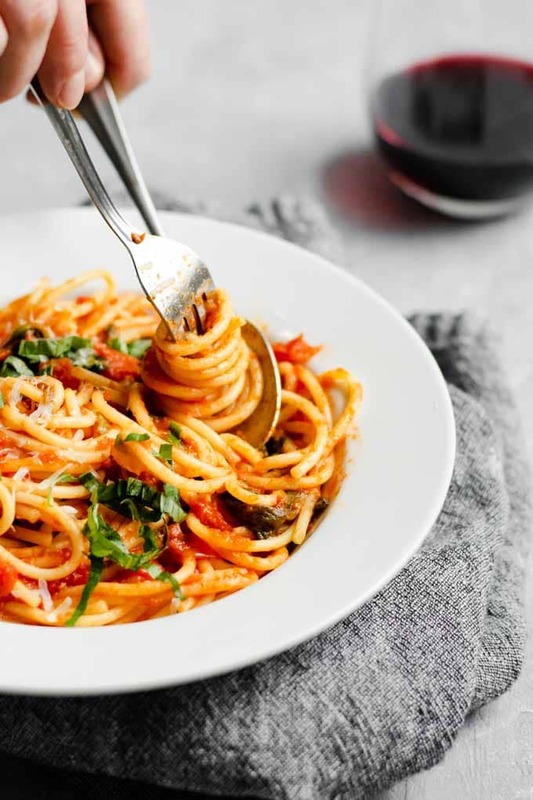 When it comes to making marinara, a few things are key and stand out in most every recipe. First, choose good tomatoes. And unless it’s late summer and the prime tomato season that is not going to mean fresh tomatoes. Instead, turn to high quality canned tomatoes for the best tomatoes for your sauce. Bonus: this means it’s a pantry friendly recipe! I have a preference for Italian tomatoes, sometimes San Marzano, but they’re not the only delicious tomato variety. Choose whole peeled tomatoes, as that guarantees you the best of the best tomatoes. Growers and canners preserve their best tomatoes for whole, and damaged or less perfect ones for diced and crushed/pureed tomatoes. Next is the simple ingredient lists. Recipes typically include garlic, onion (though not always), salt, and fresh basil. I like to add a bit of dried oregano to balance and enhance the taste of the sauce, and a pinch of chili flakes for spice. The next unifying factor in all the recipes is adding a generous amount of extra virgin olive oil and/or butter. With a good quality olive oil, I don’t think adding butter (or vegan butter in my case) is necessary at all. I also don’t use quite as much as some recipes I’ve seen, as I find that 1/4 cup of extra virgin olive oil enhances the sauce beautifully. And these 8-ingredients are all you need to make the most incredible sauce! Get everything ready to go: smash your raw garlic cloves and remove the papery skin, leaving the cloves mostly whole. Measure out the oregano, salt, chili flakes, and set aside the fresh basil. Cut your onion in half, remove the tough and papery outer layers. And get your tomatoes ready. Crush the tomatoes in your hands to break the whole tomatoes into small pieces. You want to do this before adding them to the pot (because hot oil + liquid from the tomatoes = burning splashes of oil), and ideally with your hand in a deep bowl or tall liquid measuring cup as the tomatoes are prone to splattering. Pro-tip: puncture the tomatoes or rip in half first so the juice in the center can drain out before squeezing them and breaking them apart into small pieces. Then it’s simple, add the olive oil to a pot and warm over medium-low heat. Add the garlic cloves and flash fry them. Then add the salt, oregano, crushed red pepper (chili flakes), and onion half. Stir them around, then immediately add the hand crushed tomatoes and their juices. Bring the sauce to a simmer, and let it simmer away (covered) for 45 minutes to 1 hour stirring occasionally. Over this time the garlic and onion sweeten, soften, and turn buttery in texture. The garlic cloves start to disappear into the sauce, and the onion turns so soft it is easily mashed. The sweet basil infuses the marinara with a fresh herby flavor, while the dried oregano adds earthy undertones. The pinch of chili adds just a little hint of warmth (a bigger pinch adds even more, chef’s choice). The other thing that happens during this long simmer is that the tomatoes break down, their natural sugars sweeten and caramelize, and all that delicious tomatoey flavor is concentrated. Olive oil helps release all these flavors and balances them. And over the long cooking time it adds a glossy sheen to the sauce. At the end of the long simmer, remove the basil as it’s done it’s job. For the onion you can remove it, but I like blending it into the sauce for a little extra sweetening. The garlic cloves also stay behind, either getting mashed into the sauce with a wooden spoon, or pulsed up alongside the onion. 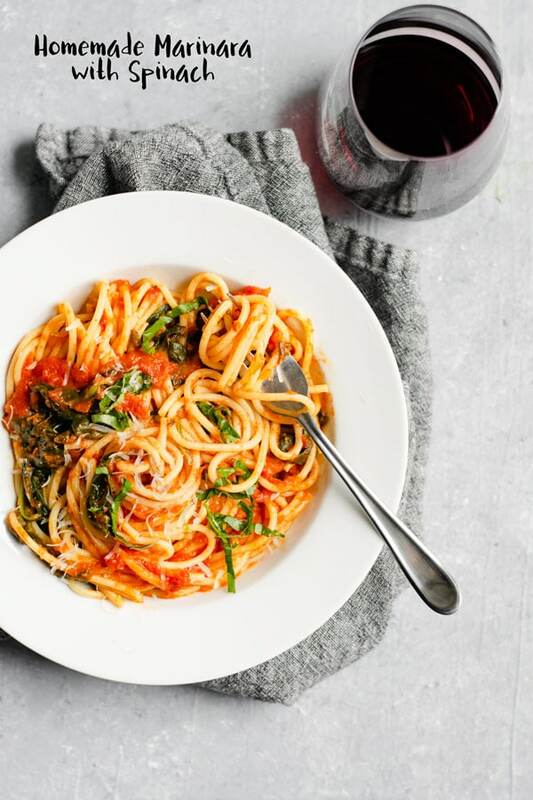 A little blitzing with an immersion blender is all you need to get that slightly textured but mostly smooth marinara, but if you don’t have one, a few pulses with a standing blender will also do the trick. The sauce can be bottled up and set aside until ready to use (it should keep for about a week), or used immediately. If eating it immediately or in the next couple of days, go ahead and sauté the spinach and add it in now so you don’t have to think about it later. When it comes to adding spinach, I like to sauté it before adding. Cooking this leafy green releases a ton of water, as anyone who has seen that an overflowing pan of spinach quickly reduces to a tiny handful can attest. I don’t want to add that spinach liquid to the marinara and dilute that delicious tomatoey flavor, and a quick flash frying lets it evaporate easily. I find it easy to use the tender baby spinach leaves. It’s easy to buy them pre-washed and they don’t require any chopping. If using big spinach leaves instead, make sure to wash them really thoroughly and chop them up before cooking. The spinach is sautéed in a small amount of olive oil, then I add just a drizzle of red wine vinegar (balsamic, white wine, or champagne vinegar would probably also be delicious). Add the cooked spinach to the sauce at the end of the sauce’s simmer, or add it when reheating the sauce, whichever works! This classic homemade marinara might not be the speediest recipe, but it is super easy and insanely delicious! Not to mention, much cheaper than store bought. 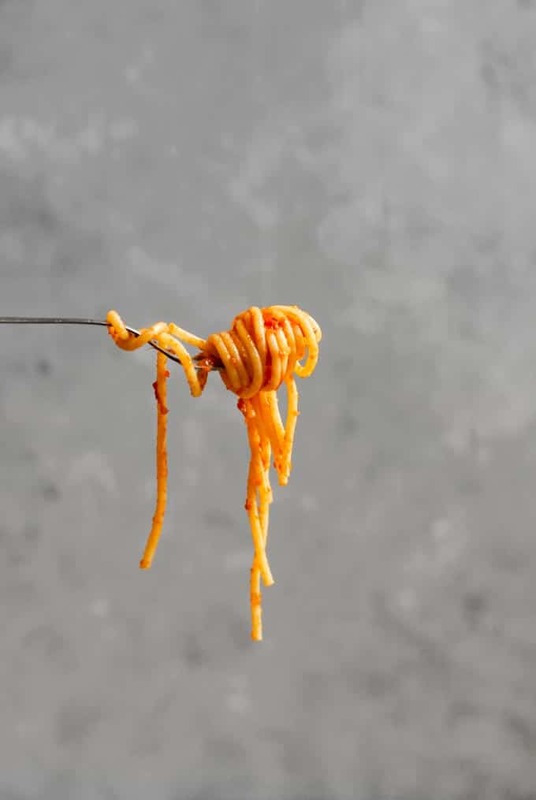 It makes enough sauce for a pound of well sauced spaghetti (or other noodle shape), and if you want more, it’s a simple matter of doubling the recipe! I do hope you guys enjoy this Italian comfort food recipe! 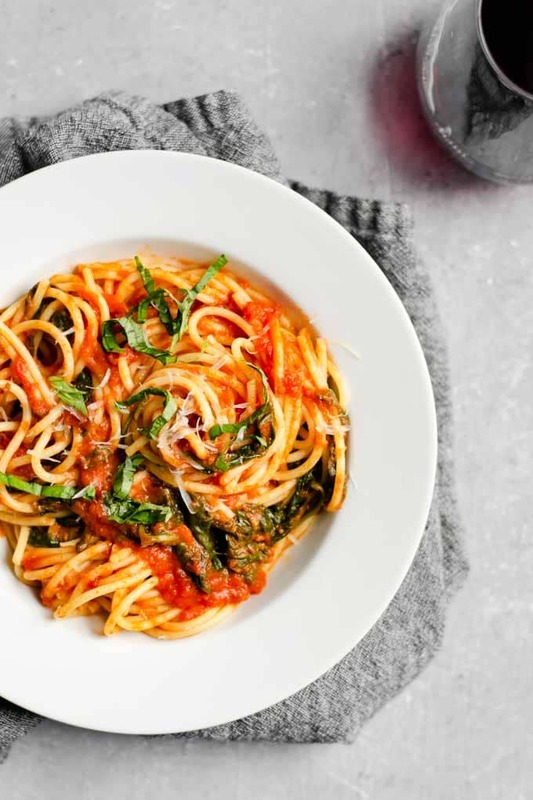 Whether or not you want to add the spinach, it’s a must make sauce! 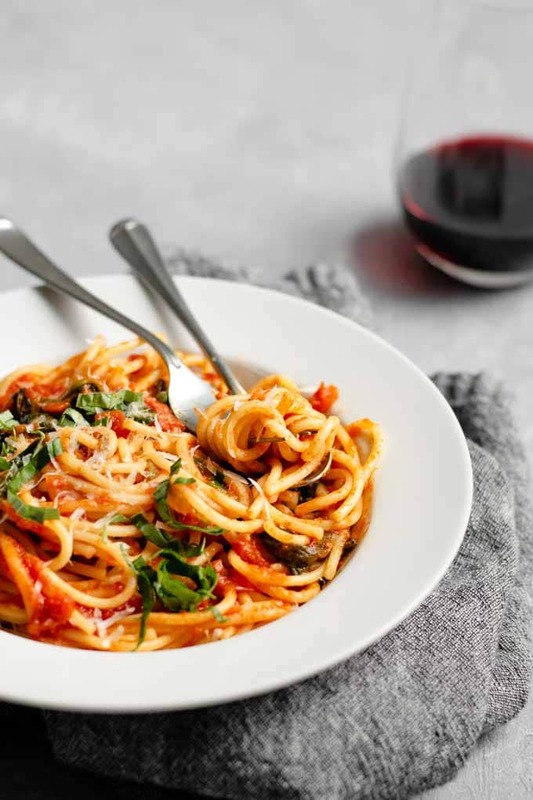 If you make this delicious Italian marinara sauce, leave a comment below and rate the recipe on the recipe card. And please share your photos with me on Instagram, tag @thecuriouschickpea and #thecuriouschickpea, I love seeing your creations! There is nothing as delicious as this classic homemade marinara sauce. It's easy to make and packs more flavor than any store bought version. Add spinach for a nutritional boost you won't even notice! Heat the oil in a large pot over medium low heat. When warm, add the smashed garlic cloves and let fry for about 1 minute until very lightly golden. Add the oregano, 1/2 tsp salt, chili flakes, basil, and onion. Stir to combine. Immediately add the tomatoes and their juices, cover the pot, and turn the heat up to medium and bring to a simmer. Turn the heat down to maintain a low simmer and let cook for 45-60 minutes, stirring occasionally. Taste and add salt if needed. Remove the basil, then using an immersion blender (or transfer to an upright blender) pulse the sauce until the onion is blended into the sauce. At this point the sauce can be used immediately or over the next week. Sauté the spinach separately: heat a skillet over medium heat and add the teaspoon of oil. Add the spinach and sauté until wilted but bright green, about 2-3 minutes. Add the red wine vinegar and let cook another 30-60 seconds. Add the spinach to the sauce and let it cook in the sauce for 5 minutes. This can happen anytime after the sauce is done, either immediately or when reheating the sauce if made in advance. Makes enough sauce for 1 pound of well-sauced pasta. *To crush the tomatoes, squeeze them in your hands to break the whole tomatoes into small pieces. You want to do this before adding them to the pot (because hot oil + liquid from the tomatoes = burning splashes of oil), and ideally with your hand in a deep bowl or tall liquid measuring cup as the tomatoes are prone to splattering. Pro-tip: puncture the tomatoes or rip in half first so the juice in the center can drain out before squeezing them and breaking them apart into small pieces. Sooo I meant to give this recipe 5 stars but apparently I can’t click properly and only gave like 4.5, ugh!! I will change it if I can figure out how! I made this sauce tonight with some thick spaghetti and hot Italian beyond meat sausage. 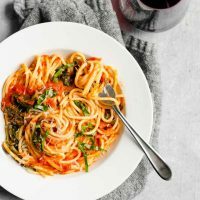 When you’re really craving that classic spaghetti dinner, this totally hits the spot, and you don’t notice the spinach (well… My toddler did). I made this pretty mild for my toddler, and she gobbled it up. My husband and I just sprinkled a little extra red pepper on top. The sauce recipe is pretty simple, but that really lets the tomatoes shine. It’s subtly sweet with great garlic and basil flavor. Way better than jar sauce! Plus, easy to build off of for different flavors or a more complex sauce!